…and fast becoming a typic al, if active, one in the life of a Durham Grosseteste Project member. An unexpected realisation is dawning – that the feel of the project reminds me of other scientific research programmes I have been involved in. I mean that I have the sense of collabrating on a project with a group of colleagues, as I have many times in the past, and that one of them is a 13th century Master to the Oxford Franciscans called Robert Grosseteste. The first of three ‘Grosseteste jobs’ that week concerned the final touches to the “science” paper from the team on the colour-perception work that has emerged from our study of De iride – On The Rainbow. There has been a beautiful scientific dialogue with Robert G on this one: in De colore he sets us a puzzle: how can we map his three dimensions of colour perception (if we can) onto our current understanding of three-dimensional colour space. In our JOSA article on this question, we were inconclusive – but a wonderful idea that occurred to Hannah Smithson while we were in Porto has come good. Grosseteste gives us a big big clue in De iride that his “axes” of purum-impurum, clara-obscura, multa-pauca can be read off the colours in the rainbow, and “different types of rainbow”. 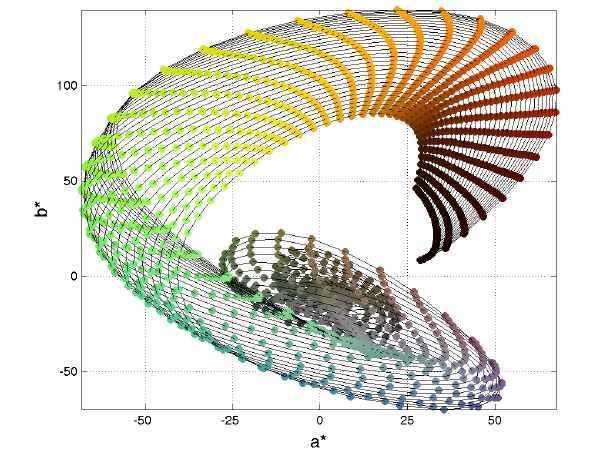 These generate beautiful spiral “maps” of the colour plane that Hannah has been able to generate using rainbow-drop physics from Philip Laven. The week’s task was to explore the third dimension – another that Robert gives us a clue to identifying. He refers to the different qualities of light as “the brightness of the luminosity is scarce, as occurs around sunrise and sunset”. 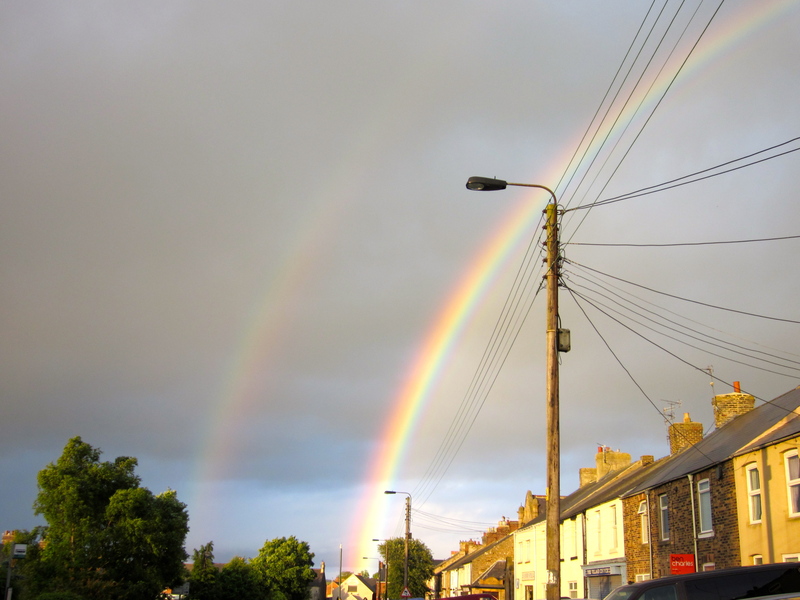 So Hannah and the team needed to access the best scientific knowledge on how the spectrum of the sun is affected Grosseteste’s rainbow co-ordinates mapped onto perceptual colour plane by H. Smithson by the increased thickness of the earth’s atmosphere as it’s elevation in the sky becomes small. At this point another “wonderful thing about Durham” comes into play – this year’s theme at the Institute of Advanced Study is . LIGHT! one of the resident fellows this term has been Bob Fosbury of the European Space Agency, who has spent much of his career working with the Hubble Space Telescope. But pertinently, he has also developed a leading expertise in the absorption of star- (and sun-) light in planetary atmospheres! Bob knows everything about the modification of sunlight by Rayleigh and Aerosol scattering and by Ozone absorption. He also is a delightful interdisciplinary thinker and a natural addition to the De iride team as we polish the next paper submission. For me, working with Grosseteste has introduced me to another scientist I needed to talk to, and as a result I now know something about why the sun is sometimes golden and sometimes red at sunset, that otherwise I would not have known. The second job was to give a school “Christmas Lecture” at York VIth form college on the project. I found that, for an unfamiliar audience, a better way to start a presentation is not with the “historical background”, which if places there can turn some people off, but to jump straight into one of the great “scientific surprises” in Grosseteste’s treatises. With a picture of a manuscript and slowly revealing the meaning of some medieval Latin to find a theory for the origin of the universe – that get’s the juices flowing a bit. The historical knowledge then gets motivated and comes in at that point before we explore further into the Expanding Universe of De luce. Finally I had been putting off an actually rather pleasant task to draft a 2500 word “Comment” for Nature to be ready for when the cosmological computing paper from De luce gets published (with Richard Bower as lead author). They ask for an “anecdotal style” and a description of the ups and downs of the project. So this is simple to do! For the third time, a sense of a personal collaboration with this extraordinary thinker emerges. 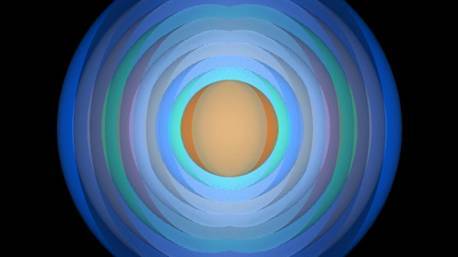 His movement from the metaphsyics to the physics of light has motivated us to explore a mathematical world of another universe – and a surprisingly rich one.